In the late-1960s, schizophrenia's profile as a disease changed dramatically. This is part 1 of an interview series where Dr. Christopher Lane interviews Dr. Jonathan M. Metzl, MD, PhD, author of The Protest Psychosis: How Schizophrenia Became a Black Disease. He is dedicated to illuminating issues of mental illness and gun violence, with a particular focus on gender and race. First, some preliminaries about your fascinating book, The Protest Psychosis: How Schizophrenia Became a Black Disease (Beacon, 2010). How did you come to unearth such a trove of important documents at Ionia State Hospital in northeastern Michigan? 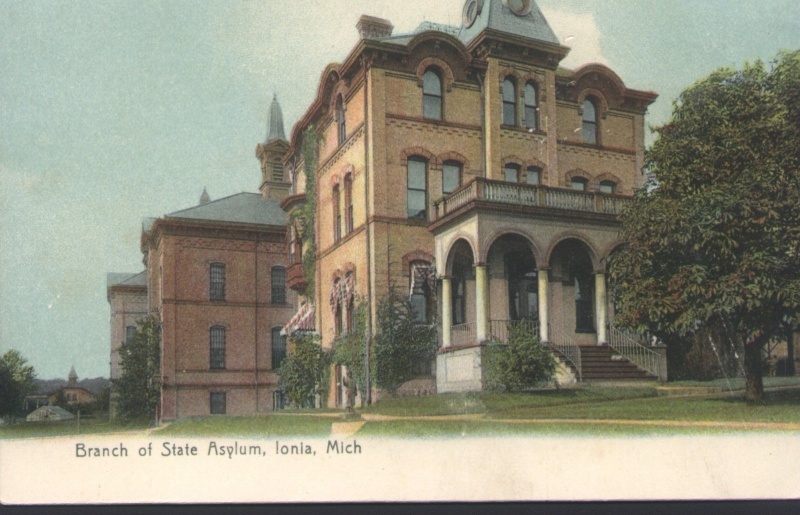 Postcard of the Ionia State hospital. Opened in 1883 it has undergone many names including: Michigan Asylum for Insane Criminals, Ionia Asylum, and finally Ionia State Hospital for the Criminally Insane before it was handed over to the Department of Corrections in 1977. All civilians were removed and it began operation as a correctional facility. Ionia State Hospital for the Criminally Insane was, for much of the twentieth century, one of the nation's more notorious mental asylums, occupying an incredible 529 acres, and its annual census hovered above 2,000 patients. But, like many American asylums, Ionia suffered a rapid fall from grace in the late 1960s and early 70s, during the so-called era of deinstitutionalization. By 1974, the census was a paltry 300, and in 1975 the facility closed, then quickly reopened—as a prison. That Rapid Transformation Fascinated me. What had Happened to the Patients? What had Changed? Why did the Hospital Become a Prison? I spent a long time searching for the records, and ultimately discovered that much of the hospital's institutional memory—nearly a century of patient charts, reports, photographs, ledgers, and other artifacts—had been placed randomly in storage in the State Archive of Michigan, in Lansing. I spent another year gaining clearance from various review boards since of course the archive contains highly personal and confidential information, then spent the next four years reviewing the charts of over 800 patients. What I found troubled me greatly. As I write in the book, "the charts documented in minute detail the tragedy of what it meant to be warehoused in a state asylum at mid-century—and, in particular, in an asylum where short court sentences devolved into lifelong incarceration. A number of charts contained yearly notes from patients to their doctors voicing such sentiments as Doc, I really think I am cured or Dear Doctor, I believe I am ready to go home, or, You have no right to keep me here. These letters stacked thirty-deep in some charts, signifying years of pleading and longing and anger, together with thirty years of responses from clinicians urging, You are almost there, or: Perhaps next year. Invariably, the last note in each stack was a death certificate from the Ionia coroner." When did you first suspect that diagnostic patterns with schizophrenia had become heavily racialized? I found dramatic racial and gender shifts in persons diagnosed with schizophrenia at Ionia during the 1960s—so much so that schizophrenia's racial and gendered transformation became the central narrative of my book. This shift became apparent very early in my research. Before the 60s, Ionia doctors viewed schizophrenia as an illness that afflicted nonviolent, white, petty criminals, including the hospital's considerable population of women from rural Michigan. Charts emphasized the negative impact of "schizophrenogenic styles" on these women's abilities to perform their duties as mothers and wives. To say the least, these patients were not seen as threatening. "This patient wasn't able to take care of her family as she should", read one chart. Another, "This patient is not well adjusted and can't do her housework", and another, "She got confused and talked too loudly and embarrassed her husband." Perhaps the most shocking evidence I uncovered was that hospital charts "diagnosed" these men in part because of their symptoms, but also because of their connections to the civil rights movement. Many of the men were sent to Ionia after convictions for crimes that ranged from armed robbery to participation in civil-rights protests, to property destruction during periods of civil unrest, such as the Detroit riots of 1968. Charts stressed how hallucinations and delusions rendered these men as threats not only to other patients, but also to clinicians, ward attendants, and to society itself. You'd see comments like "Paranoid against his doctors and the police", or, "Would be a danger to society were he not in an institution." Included a mini-bio of Jonathan M. Metzl, MD, PhD for clarity. Changed "That Rapid Transformation Fascinated me. What had Happened to the Patients? What had Changed? Why did the Hospital Become a Prison?" into a header for emphasis.